Great Lakes Restoration Initiative edge-of-field monitoring focuses on identifying and reducing agricultural sources of excess nutrients which threaten the health of the Great Lakes. The USGS supports these efforts by utilizing edge-of-field monitoring to assess the quantity and quality of agricultural runoff and evaluate conservation practices that aim to reduce sediment and nutrient loss. Learn more by visiting the interactive GLRI edge-of-field story map. The Great Lakes contain over 20% of the world's surface fresh water providing drinking water to over 40 million people, numerous recreational opportunities, and billions of dollars in economic benefits across the region. The Great Lakes Restoration Initiative (GLRI) was implemented in 2009 to help protect, restore, and maintain the Great Lakes ecosystem now and for future generations. Now in its second phase, the GLRI Action Plan II (2015-2019) identifies strategic, priority actions to help to achieve the vision of a restored, protected, and sustainable Great Lakes ecosystem. The USGS has a long history of conducting scientific research in the Great Lakes Basin and we work closely with our Tribal, Federal, State, and local partners and stakeholders. Our GLRI science is structured to meet the goals and objectives of the five GLRI Focus Areas, and results from our research, monitoring, and other on-the-ground actions provide the scientific information needed to help guide Great Lakes restoration efforts and demonstrate the importance of science for restoration success. One major objective of the GLRI Action Plan II is to reduce nutrient loads from agricultural watersheds by implementing conservation or other nutrient-reduction practices. These efforts focus on reducing phosphorus, an essential element for plant growth that is commonly applied to maintain profitable crop production. Excess phosphorus that is not taken up by plants can be washed into rivers and streams, eventually flowing into the Great Lakes. Increased nutrient inputs can threaten the health of the Great Lakes ecosystems by contributing to harmful algal blooms and other algal growth that can affect human and wildlife health, impair drinking water, and result in loss of recreational opportunities. Explore the GLRI Priority Watersheds map. 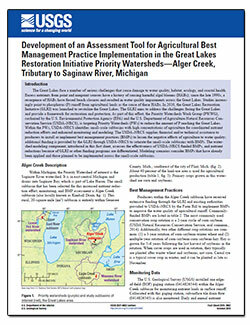 GLRI efforts to reduce nutrient loads are focused on four targeted Priority Watersheds. These watersheds were selected because of high density of agricultural land use and their ecosystem impairments. All Priority Watersheds are associated with designated Areas of Concern, which are waters of significant environmental degradation. The U.S. Department of Agriculture (USDA) Natural Resources Conservation Service (NRCS) provides funding and support to Priority Watersheds producers (farmers) to implement conservation practices to reduce the amount of nutrients that run off their agricultural fields and eventually enter the Great Lakes. The USGS supports these efforts by monitoring the quality of runoff at the edge of agricultural fields; this study design helps us evaluate the effectiveness of specific conservation practices. Our expertise in study design, monitoring site and streamgage installation and maintenance, data collection and analysis, and water-quality modeling provides a rigorous scientific backbone for this project. 1) Reducing nutrients, primarily phosphorus, in agricultural runoff from the four GLRI Priority Watersheds. 2) Monitoring and modeling the phosphorus-reduction effectiveness of agricultural conservation practices. USGS scientists work closely with NRCS staff to identify the sources of phosphorus and other nutrients, and to quantify runoff water quality before and after conservation practices are installed. 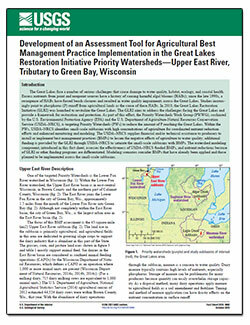 The data collected is also used to predict potential phosphorus reductions on a broader watershed scale. Rapid sharing of project results with local watershed stakeholders informs adaptive implementation of conservation practices and encourages producer communication. Explore the GLRI edge-of-field project subbasins and sites. 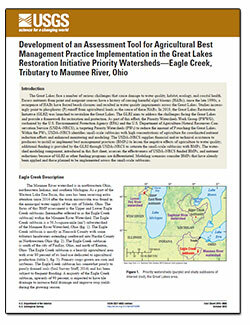 EOF monitoring for the GLRI Priority Watershed effort began in 2012. A typical EOF monitoring project lasts 5 to 10 years, including 2-3 years of monitoring prior to the implementation of planned conservation measures. As of May 2016, there are 22 active GLRI EOF sites (14 surface and eight subsurface tile) in six subbasins in Wisconsin, Michigan, Indiana, Ohio, and New York. The EOF monitoring and modeling directly address the measures of progress listed in the GLRI Action Plan II and provides beneficial data and products that help other partnering agencies accomplish their activities, allowing a more adaptive approach to both the monitoring and the conservation goals of GLRI. A conservation practice is an activity that protects or improves natural resources, such as reducing soil erosion or nutrient loss, improving water quality, or restoring wildlife habitat. The primary goal of the Priority Watershed effort is to evaluate the impact of the accelerated implementation of NRCS conservation practices, and EOF monitoring helps quantify conservation practice effectiveness through direct water-quality monitoring and watershed impact modeling. Although the USGS collects water data in streams and at field-site EOF stations, we partner with the NRCS to collect and manage on-farm agronomic data. On-farm data includes a description of any farm activity that occurs on monitored fields (what, how much, and when each activity occurred). This data is crucial for interpreting changes in runoff quantity and quality due to the implementation of conservation practices. Input and output products of the Soil Water Assessment Tool (SWAT) used for edge-of-field modeling. EOF data collection characterizes current conditions and allows us to detect on-the-ground changes over time. However, to predict future conditions, or to assess the cost-benefit of potential changes resulting from the implementation of numerous conservation practices, modeling is needed. Water-quality models are built using land use, soils, elevation, climate, and land-management practice data tailored to each EOF site's farm field basin (also called a Hydrologic Response Unit, or HRU). With additional on-farm information provided by NRCS, these models quantify the potential changes that result from conservation practices and help assess the cumulative effect of multi-farm changes on the water quality of the larger watershed. Since these models represent common Great Lakes agricultural practices, basin-level results are often transferable to other agricultural areas across the Great Lakes basin. For this GLRI EOF project, the Soil and Water Assessment Tool (SWAT) model was selected to characterize the impact of the conservation practices at the stream subbasin scale. Mean and annual unfrozen/frozen-ground phosphorus runoff from six edge-of-field study farms in Wisconsin (from a previous EOF study, USGS Scientific Investigations Report 2011-5008). Evaluations of conservation-practice effectiveness using the monitoring data should be available by the end of the GLRI Action Plan II in 2019. In advance of those results, the modeling component will help forecast water-quality improvements based on the in-progress monitoring data. This effort can help agencies and stakeholders start adaptation and implementation plans. Sharing early monitoring results with local watershed stakeholders can provide valuable information for use in adaptive implementation and farmer-to-farmer communication. One of the strengths of the GLRI EOF monitoring project is the direct interaction between producers, conservationists, and science agency personnel. This monitoring and data-sharing approach relies on strong involvement and communication between agencies and producers to promote collaboration and partnership building. This commitment to collaboration extends beyond the final assessment of conservation practice effectiveness. Sharing early monitoring results with local watershed stakeholders can provide valuable information for use in adaptive implementation and farmer-to-farmer communication. It also provides an avenue for feedback from the agriculture industry that can help with promotion and implementation of the conservation practices.